Wouldn’t it be absolutely incredible to have your all-time favourite band come and play at your wedding reception? Unfortunately, unless you are either related to or can number Mick or Keith or Paul (or even better, Simon) among your close friends, or you are quite obscenely loaded anyway, this is and will remain purely a pipedream. However, you could have the next best thing. There is a growing number of high-quality, authentic-sounding Tribute Acts operating across the UK, paying faithful homage to the music and replicating the stageshows of iconic international superstars of the recent past. The musicians in a tribute band strive to express their shared passion for a particular recording artist’s or band’s music by diligently replicating their performance as accurately as possible. Naturally, all of the most popular hits will be covered, together with some of the less well-known items selected from the original’s back-catalogue. 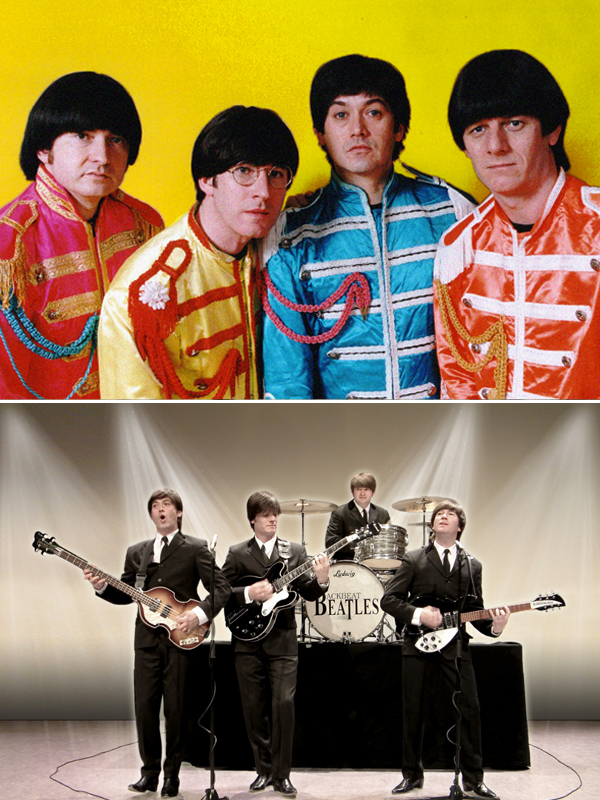 In most cases, in purely musical terms it can be difficult to separate the replica from the real thing, and occasionally the tribute band’s performance even exceeds the original. Shut your eyes and suspend your disbelief – perhaps Elvis has not yet left the building after all! Minute attention to detail in every aspect of a tribute act’s performance is a critical part of their artistic approach. Everything will be accurately replicated, from the sound and stage-lighting to the costumes, makeup and hairstyles. The musicians will act completely ‘in character’ and choreographed dance-routines and general movement will also be closely observed, so that the overall effect will sound and look uncannily like the original. To complete the effect, you could ask your guests to come to the wedding reception in appropriate ‘period’ dress to involve them interactively in the theme – most tribute acts welcome audience participation!